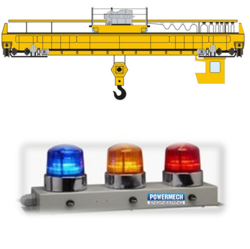 Manufacturer of a wide range of products which include crane dsl bus bar indicator lamp. Phase Indication Lamp for DSL Busbar for Cranes and Machinery To protect single phasing, we supply Phase Indicator System for Crane DSL Bus Bar with best quality LED Lamps and the body of the indicator is powder coated. This Indication lamp can be connected to bus bar or panel board of crane. ■ Bus –bar 3 Phase power indication approach towards Crane Bus-bar 3 Phase power indication for the overhead cranes. It is a vibration-resistant, solid-state LED based unit which provides a long maintenance free operating life. ■ Use of Ultra - bright LED for Omni directional view from long distance. ■ Clear indication of Phase energized status of supply on the adjacent bus-bar.so there is no confusion to plant personnel. ■ Low cost replacement of incandescent lamps which are generally used for this application. ● Crane Bus-bar 3 Phase power indication for over head cranes. ● Vibration and shock proof design. ● Clear Omni directional visibility due to use of Ultra-Bright LED Lamps. ● Option of RYB or RYG colors. ● In built Low voltage Glow Protection (LVGP) circuit to prevent false indication at leakage input voltage. ● Very short payback period. ● Rugged design tropicalised for Indian conditions. ● Quick and easy installation. ● Option of wall mounting bracket or vertical stand mounting. ● Fully tested against humidity, temperature and vibration. ● Extensive transient protection testing has been performed to ensure faultless operation even under ● severe climatic conditions such as lighting. ● System purpose-designed for long life in carnage environment. Minimal number of moving parts with solid-state circuitry. Hence long uninterrupted service. Looking for DSL Busbar Indication Lamp ?